It’s been what… 21 years since I’ve heard a new Christmas carol? And growing up in San Diego, about .00001% of them applied to me and my festive experience. The fact is, delusion is rampant for Southern Californians who sing about a white Christmas while tanning their cheeks in banana hammocks on the beach. “Just hear those sleigh bells jing-a-ling-ling-ling-ling…” Everyone would sing in my elementary school classes. I’d look around… Has everyone gone mad here? I don’t hear any sleigh bells. It’s 80 degrees out and I’m wearing my Limited Too halter-top in December. Most of us wouldn’t know a sleigh bell from the gong at Stir Fresh. Not to mention it’s October when the tunes come rollin’ out on the radio, and they blare until the day before Christmas. I can only hear so many versions of “Jingle Bells” renditions before I want to blast my ears off with a snowblower. Maybe there’s something to be said about the American obsession with playing bad songs over and over again (see: American Top 40). Side note: the day I realized what the lyrics of “Santa Baby” meant was a traumatic one. And isn’t it a little strange that we sing about a child discovering the infidelity committed between his mother and a fantasy man older than his grandpa in “I Saw Mommy Kissing Santa Claus?” Where’s daddy in the picture? I know a gold digger when I hear about one. Side note: I learned how to determine the difference between “sleigh” and “slay” at a young age. 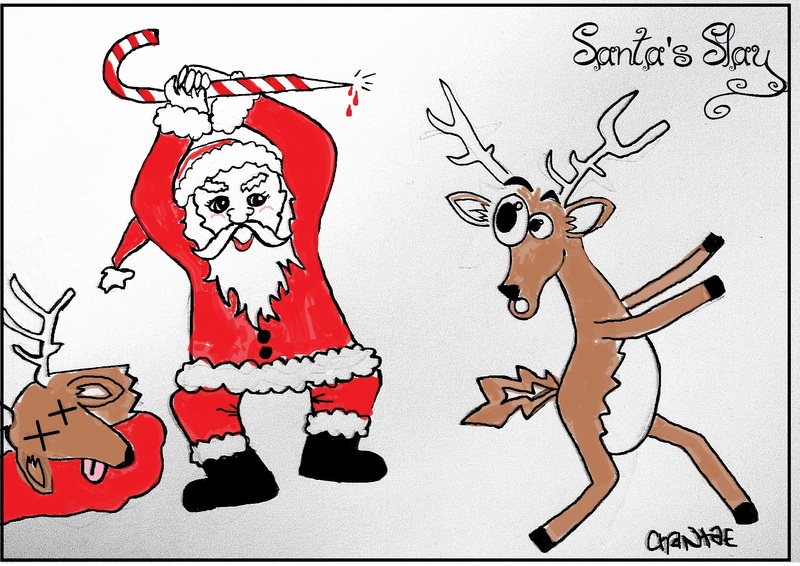 When my fellow classmates would write “Santa’s Slay” on their Christmas art project, my mind immediately conjured up this (see below) image which also happens to be quite traumatic. There are quite a few fictional characters I relate to — the Grinch being one of them. He’s my role model — we have the same disgust of certain Christmas traditions, love dogs, and never comb our hair. He remains a role model because he was able to overcome the first of those three things. Neither of us have made any progress with the hair combing, though. I’ve wanted to be the Grinch for Halloween for the past three years. If society is going to inflict Christmas on the world two months early, I at least want to capitalize on some of it. Since 2009, I’ve begged my boyfriend to let us dress as the Grinch and Max (the dog). Me being the Grinch of course… I received an adamant no until this year, where he agreed to be Max so long as I would be a character of his choice for a different night. He picked Honey Boo Boo… but then he was going to be Sugar Bear — Honey Boo Boo’s dad — which is creepy, so we revised it to be Honey Boo Boo and her pig Glitzy. A win in my eyes. Unfortunately, due to some travel complications, we were unable to meet up for Halloween so my plans of being the Grinch fell through again. 2013 — I’m looking at you. For the love of all things Christmas, let’s please get some new tunes this year. Or at least play some undiscovered oldies? Bob Dylan made an album — that has to be interesting to say the least and will be making an appearance at all of my Ugly Sweater Parties for sure. I’m not done with talking about Christmas, it’s only November 11th so I’m getting started early (just like the rest of the country)! This entry was posted in Travel and tagged carol, cartoon, christmas, christmas carols, commentary, elf, reindeer, singing, slay, sleigh, the grinch, the oatmeal on November 12, 2012 by chantae.